Jaguar has launched an all-wheel drive version of its popular XF saloon. Powered by a 2.0-litre diesel engine, the AWD XF is designed to offer drivers more traction and confidence on slippery conditions, by transferring the right amount of torque to the front axle should additional traction be needed. Despite being four-wheel drive, the XF AWD still returns impressive economy figures, with CO2 emissions starting at just 129g/kM CO2. It also manages a combined consumption figure of 57.7mpg. 0-60mph takes just 7.9seconds, topping out a maximum speed of 138mph. 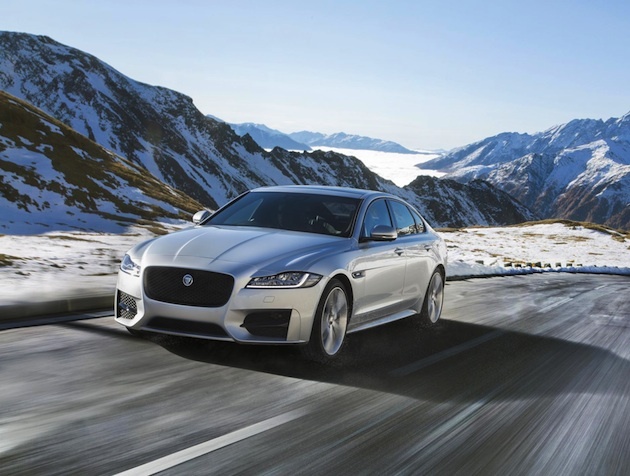 Incredible technology means that the XF AWD is capable on any surface. Intelligent Driveline Dynamics mean that the friction between tyre and road surface is constantly monitored to see how much of the available grip is being accurately exploited. Not only this, by Dynamic Stability Control keeps the driver safe by detecting times when the car may lose control and correcting this. All of the power is sent to the road through a smooth eight-speed ZF double-clutch gearbox. Kevin Stride, vehicle line director, Jagaur XE, XF and F-Pace, said: “The all-new Jaguar XF is already established as the most dynamically-rewarding saloon car in the business segment. Now we’re making the performance and traction benefits of all-wheel drive accessible to more customers worldwide by combining the system with our clean, refined and efficient Ingenium diesel engines.